In March 2006 a Company called Logical Buildwell Private Limited (LBPL) was formed. Within months, in 2 separate transactions, LBPL bought a stake of 73.38% in a company called Dehradun Tea Co. Ltd (DTC) by taking over its shares at a total price of around Rs 115 Crores. Coming back to LBPL, how did they fund this acquisition? Within days of its formation, LBPL received an unsecured loan, officially classified as “advance against land”, from Emaar MGF in the form of an unsecured loan. According to its balance sheet for the year ended March 31, 2006, the company owed Rs 76 crore to Emaar MGF. So who owned LBPL? On May 31, 2006, the shares in LBPL were transferred to Emaar MGF Group Financial Controller Vijay Sajjanhar and Assistant General Manager (finance) Gautam Kalani, and they took charge as directors of the company. Further, the shareholding also changed significantly days before the public announcement of the deal was made on July 13, 2006. On July 1, Logical received an investment from two companies, Amardeep Properties and Compact Properties in the form of subscription to preference shares. And both these companies were rather generous to LBPL too. Firstly, they bought Rs 10 redeemable preference shares of two-month-old LBPL, which carried a meagre 0.1% as Interest, at a premium of Rs 110 per share. Additionally, they also bought 4 million shares each, thereby giving Rs 96 crore to the company. And who are the promoters of Amardeep Properties and Compact Properties? They are Surender Verma and Chintan Dewan, the same Emaar MGF employees who floated LBPL in the first place. So to summarize, a company (LBPL) floated by Emaar MGF employees, got transferred to 2 other Emaar MGF employees, and got an unsecured loan from Emaar MGF, and got cheap share capital from 2 companies again owned by Emaar MGF employees. This LBPL bought a 73% stake in defunct company (DTC) for Rs 115 crores odd. The only thing worth value in DTC was the land it owned. Further as per the DRHP filed by Emaar (Page 67 Here), Emaar claims to own 1129 Acres of land in Dehradun. 1129 odd acres of land in Dehradun owned officially by LBPL and 1129 odd acres claimed to be owned by Emaar MGF in a separate document. Going ahead, LBPL changed its name to Loam Realtors Private Limited (LRPL). Amardeep Properties becomes Alcove Realtors and Compact Properties becomes Cameo Realtors. 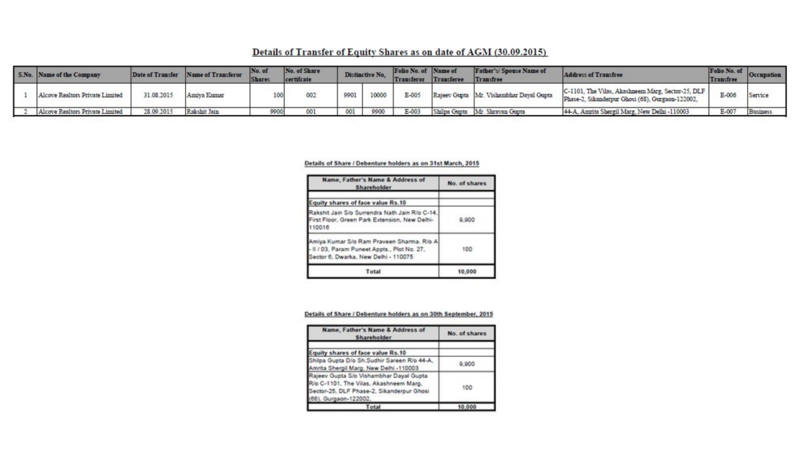 Circa 2015 the ownership of Alcove and Cameo changed hands from employees of Emaar MGF to Shilpa Gupta wife of Shravan Gupta the Managing Director of Emaar MGF. Now the story progresses. The 1128 Acres of land owned by DTC was intended to be sold off to Uttarakhand Government for a price of Rs 1728 Crores for the Smart City project. Remember, the price paid by LBPL to DTC (which owns the land) to acquire a controlling stake was Rs 115 Crores. Further in Uttarakhand the land ceiling laws do not allow such a large holding of land, so was this web of companies created to circumvent these rules? Also, the Tea Board manual requires that prior permission must be taken to admit a “partner”. Was this done? If yes, on what basis did the UPA Government give permission to take over tea estate gardens to a real estate Company? The common Director in Emaar MGF and DTC holding entities is one Mr. Rakshit Jain who was the General Manager Finance at State Industrial Development Corporation of Uttarakhand (SIDCUL). Kanishka Singh, is often described as a long-time close “aide” of Rahul Gandhi and Priyanka Gandhi. MGF though has denied links with Kanishka Singh. After protests by environmental groups and other citizens on social media the state government decided to take an online “poll” to highlight concerns relating to the project. This poll had its own concerns with many users calling it “farce” and “tedious”. As of today the State Government seems to be dropping the idea of takeover of the tea gardens after a lot of pressure from social groups both online and offline. While most of the protesters were up in arms against the fact that the environment would be damaged, one wonders whether any of them knew about the games behind the curtains. Major Dhoundiyal along with three soldiers was killed in an encounter with terrorists in Pulwama district.